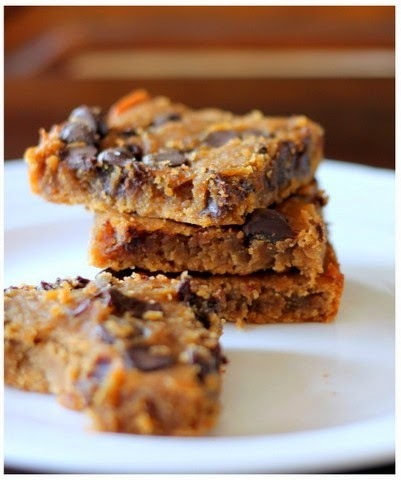 Healthy, Fit, and Focused: Flourless Blondie Cookies - Delish!! Flourless Blondie Cookies - Delish!! Well, ever since I made the Dark Chocolate Flourless Brownie Muffins last week, it got me wondering what else could I find to add to my book of healthy desserts!! Let's face it, the holidays are coming up and we all love to enjoy some sweets during that time, so why not find some healthy recipes that are super yummy and aren't going to bust a belt!! Success...I found a recipe! It was exactly what I hoped it would be...a keeper!! And yes, they are made with chickpeas!!! Mine weren't as pretty so I used pic from site! Preheat oven to 350 degrees F and spray 8x8 inch pan with nonstick cooking spray. In a food processor, add all ingredients except chocolate chips and process until batter is smooth. Fold in 1/3 cup of chocolate chips, I like to use dark chocolate (because they're the best!!). Note: Batter will be thick and super delicious, so you could actually just eat it on it's own! Spread batter evenly in prepared pan then sprinkle 2 tablespoons of chocolate chips on top. (The batter may stick to your spatula, so I like to spray my spatula with nonstick cooking spray first.) Bake for 20-25 minutes or until toothpick comes out clean and edges are a tiny bit brown. The batter may look underdone, but you don't want them to dry out! Cool pan for 20 minutes on wire rack. Sprinkle with sea salt then cut into squares. Makes 16 blondes. I'd love to know how your Blondies turned out. After you make these go to my Facebook page www.facebook.com/HealthyFitFocused, take a picture of them and tell me how they turned out. Halloween Candy DETOX & The 3 Day Refresh!! A Soccer Mom Kind of Day! !